Often the camera does things that can only show up as visible in a photograph; that’s the magic of the medium. 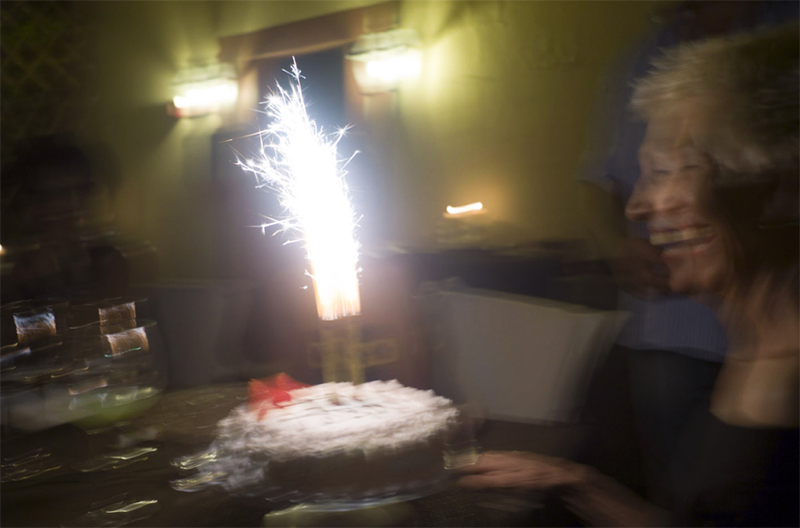 Maggie ‘s cake came out with a sparkler blazing away, and when I made the shot the sparkler had a fraction of a moment of less sparkle before exploding again, and in that space the shutter – at 1/ 30th of a second – was open long enough to make 2 recordings of everything. 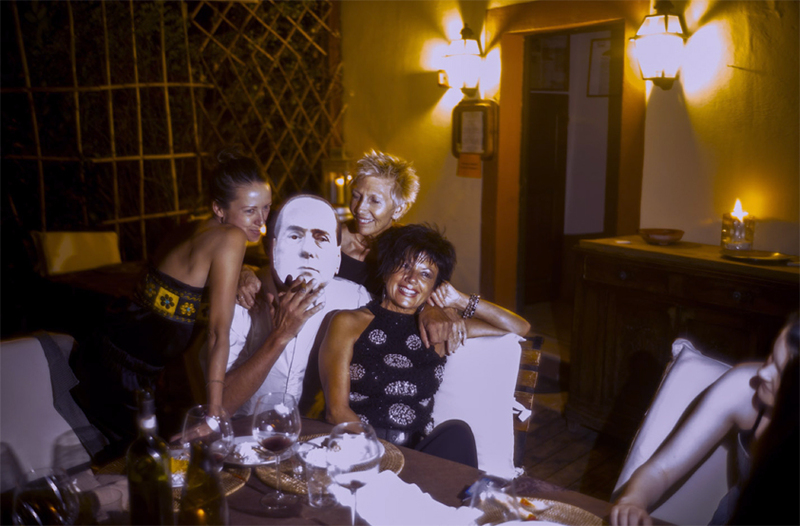 Then someone put on a Berlusconi mask and just as in his real life the women flocked to him. And here again an accidental ‘catch’ occurred, someone else’s flash went off just as I opened my shutter and it produced this ‘bronzy,’ garish color and hard light. This entry was posted in Family Life, Girls, Interior, Maggie Barrett, Night, Portrait, Restaurant and tagged Birthday, Cake, Interior, Maggie, restaurant on August 8, 2015 by joelmeyerowitz2014. Mark, Thanks, please pass along Maggie’s best wishes to her. Fun shots that are also really, really good! That garish effect from the other person’s flash going off is perfect for anything to do with Berlusconi. I don’t know if you keep up with the digital edition of the NY Times, but one hilarious bit in their coverage of Donald Trump was an Italian woman who lives in Trump Tower commenting that she wishes she could vote for him because he would be the American Berlusconi. Fun should not be discounted from ‘serious’ photography. All moments are worthy of a second or at least a hard look at what is making them happen.